Wisley Pink Sunrose is a shrubby perennial that has silvery-grey foliage. In late spring to midsummer it is covered with pastel pink blossoms. The blossoms will attract butterflies. It will grow to a height of 10"-12" tall and 16" to 18" wide. Plant Wisley Pink Sunrose in full sun and well drained soil. Wisley Pink Sunrose likes it hot and dry. It will become drought tolerant once it is established. 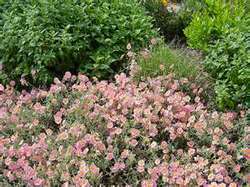 Use Wisley Pink Sunrose on a sunny slope, in a Rock Garden, Cottage Garden, as a ground cover, or in a container. It also works well as a cut flower and is deer resistant. This perennial is also great to use for erosion control.